While an Android phone without an active internet connection can be used for only making phone calls and texting, that’s not what a smartphone is meant for. To help consumers actively use their smartphones for social networks, apps, Beijing Gamease Age Digital Technology has announced a new app that lets you share your PC connection with your phone. 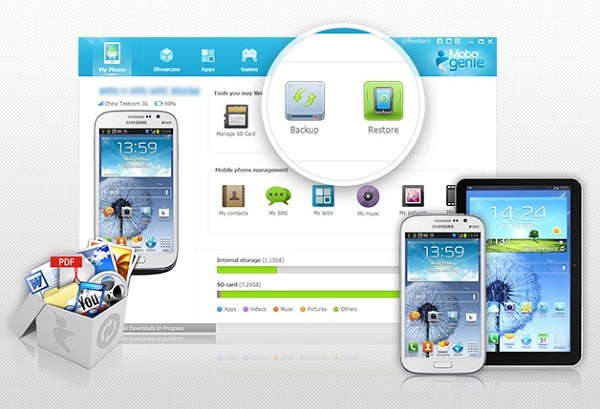 Mobogenie is an Android based data manager allows user to manage that lets you manage your device from the desktop. The app supports various activities right from basic syncing to backup and restore. The app also helps in managing messages, contacts, sending SMS’s using the PC keyboard. The app can also be used to download apps, games and ringtones onto the phone. The Mobogenie app has a very easy to use and navigate User Interface with just seven basic tabs – Phone, Showcase, Apps, Games, Music, Images, and Videos. The Phone and Showcase tabs are used to download, store and access the files. The Apps tab can be used to source new apps for installation. The Music, Images, and Videos tabs can be used to access all the multimedia content of your phone. The Mobogenie app can be directly downloaded from the app website.